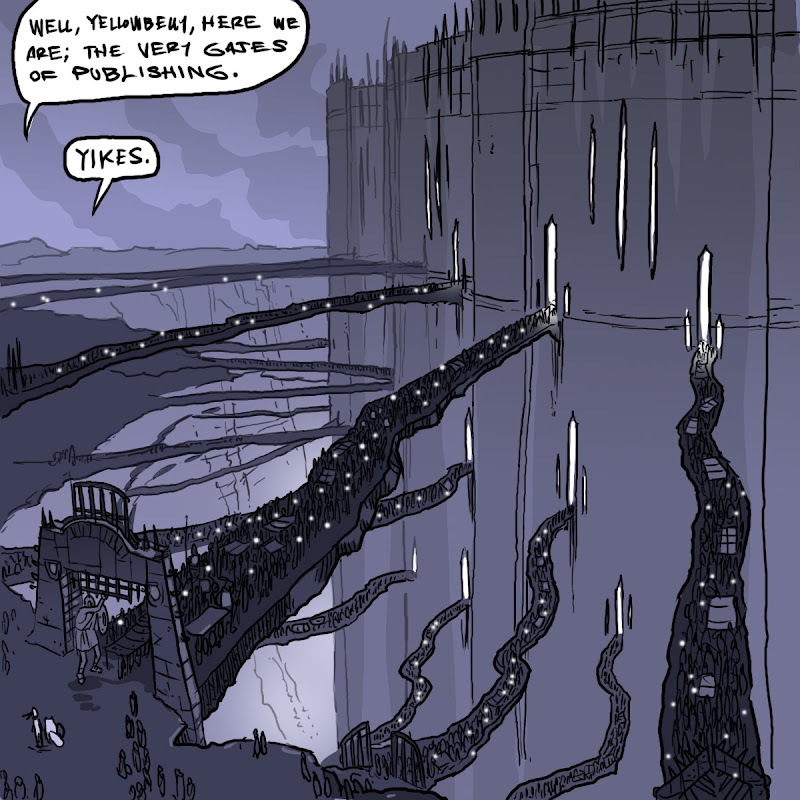 The LAND OF DOOM will be back tomorrow--I've got a nice page of it, it just needs coloring. Sorry for the gaps! But the marathon's the thing! Synopsis: Three Miocene Era ponies (three-toed Hypohippus, to be exact) are being chased by a giant Terror Bird (Titunis walleri.) 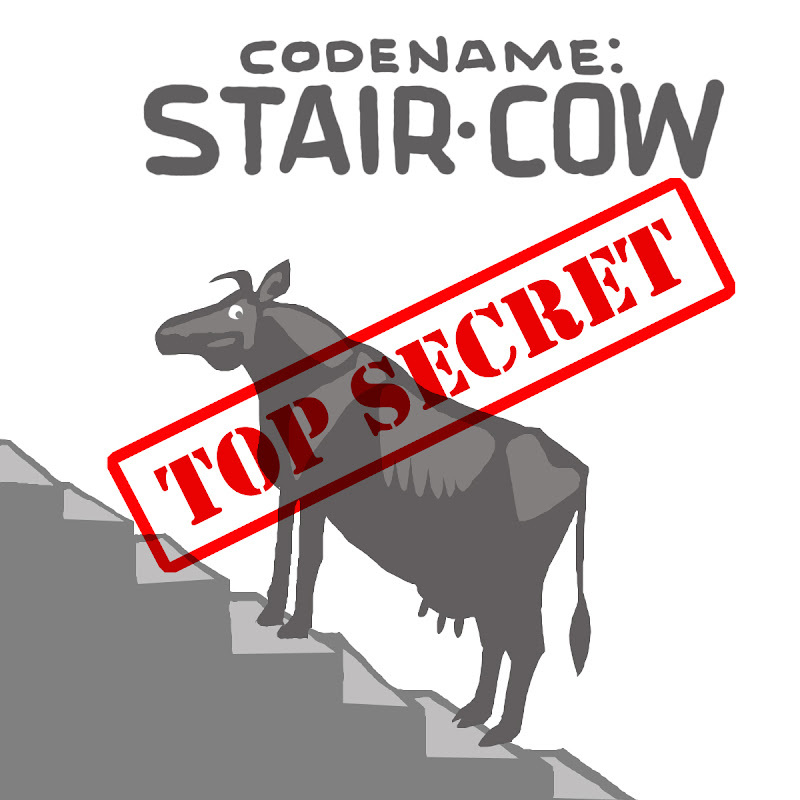 To escape, they must use their "tricks," one can jump super high, one can run very fast, and one can bite. Kinda like "The Seven Chinese Brothers," only during the Pleistocene. At what point did ponies become GIRLS ONLY territory? If kids are around a real pony, EVERYONE'S excited--but as soon as the pony moves out of reality and into entertainment--BOOM--just for girls. 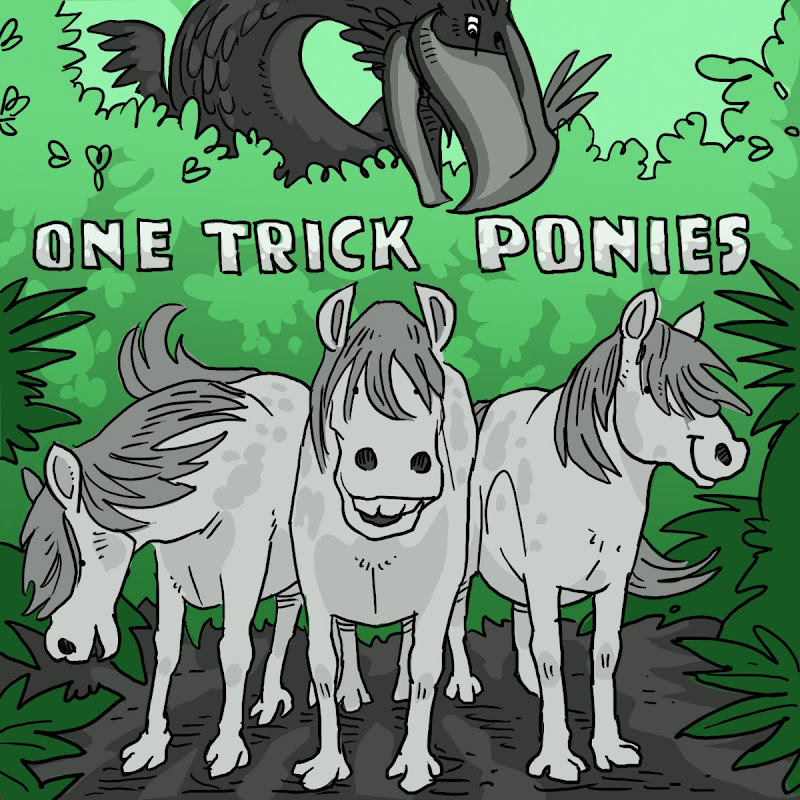 Here's a shot at making ponies fun for girls and boys. 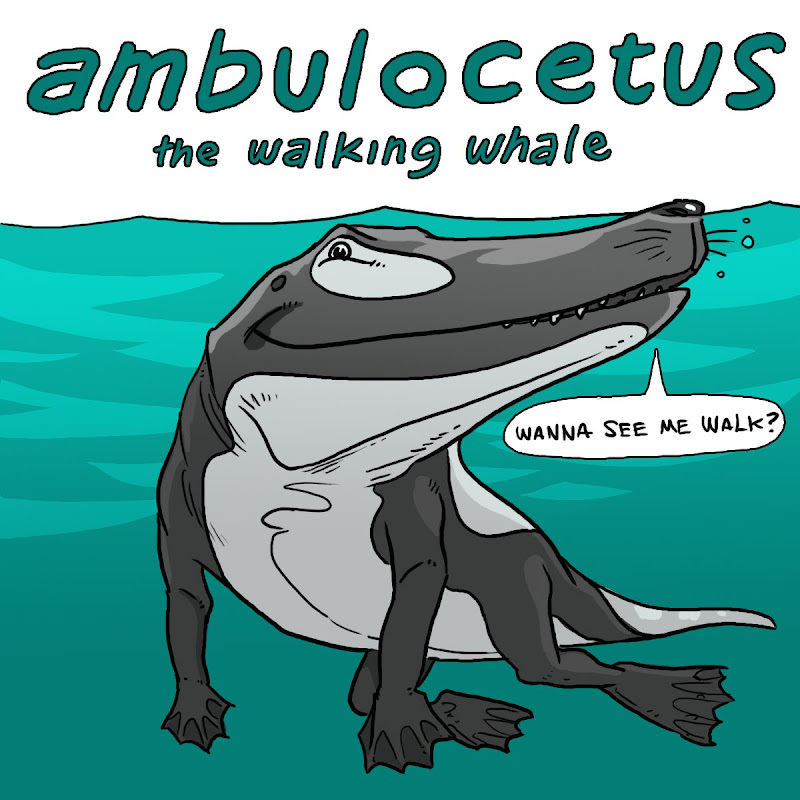 Are there any other animals with such a one-sided gender fanbase? Mile 25! Oh, this is brutal! Feel the burn! Feel the BURRRRN! Synopsis: A mysterious seed falls to earth and begins a plague of "Space Weeds!" It's up to a team of elite lumberjacks to put a stop to the invasive species. With the help of a genetically resurrected Castoroides beaver and a jar of weapons-grade termites, our team will face the ultimate killer-plant threat! Prepare for TREEMAGEDDON! Ah-ha! It's the long awaited answer to last October's SPACE WEED story a.k.a. 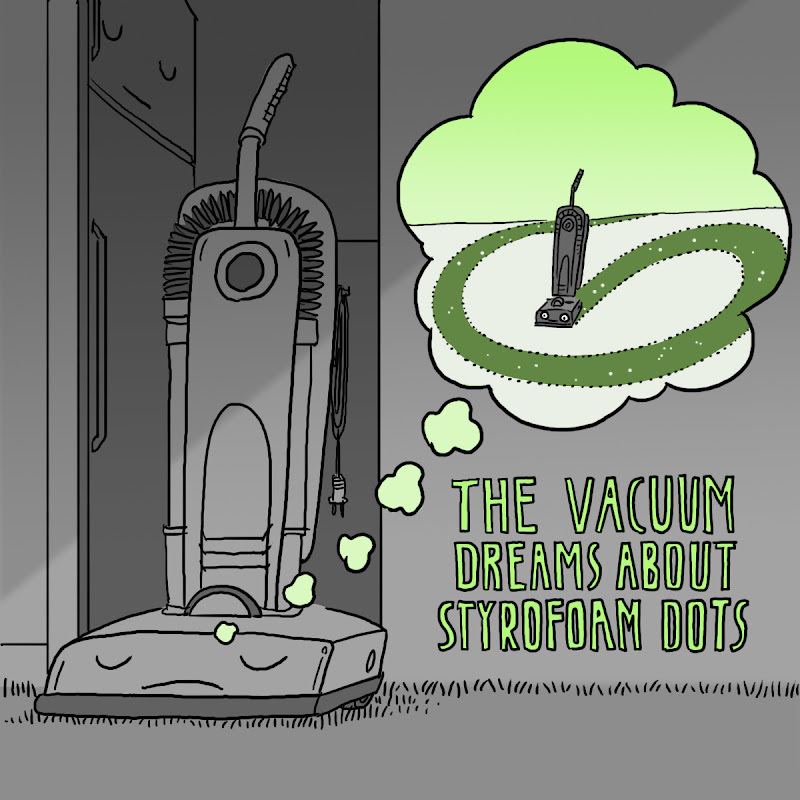 "My Idea For a Saturday Morning Cartoon." 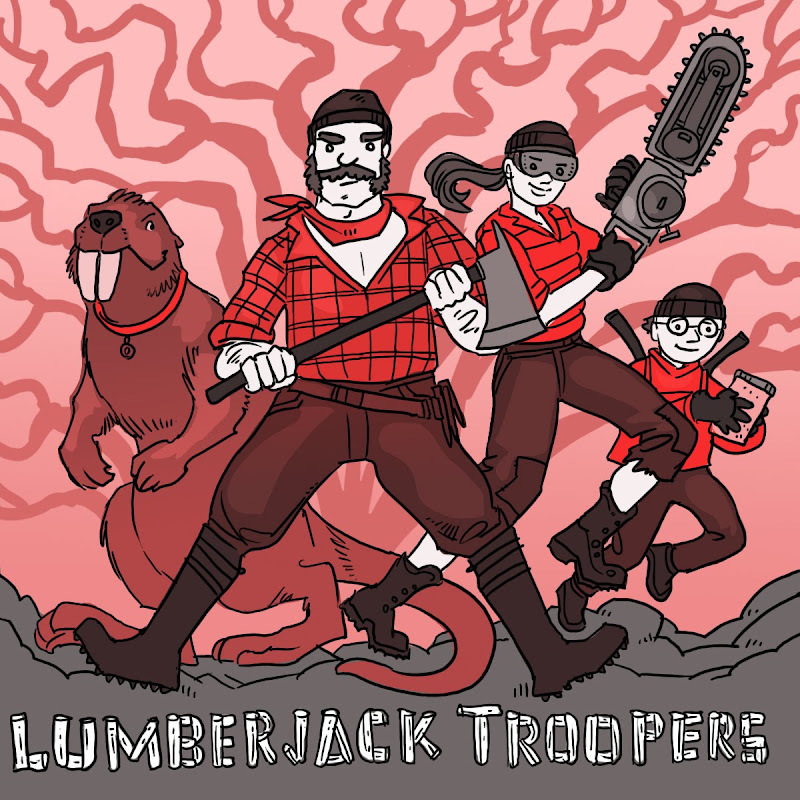 See it here (scroll down a ways) this is the prologue to LUMBERJACK TROOPERS! 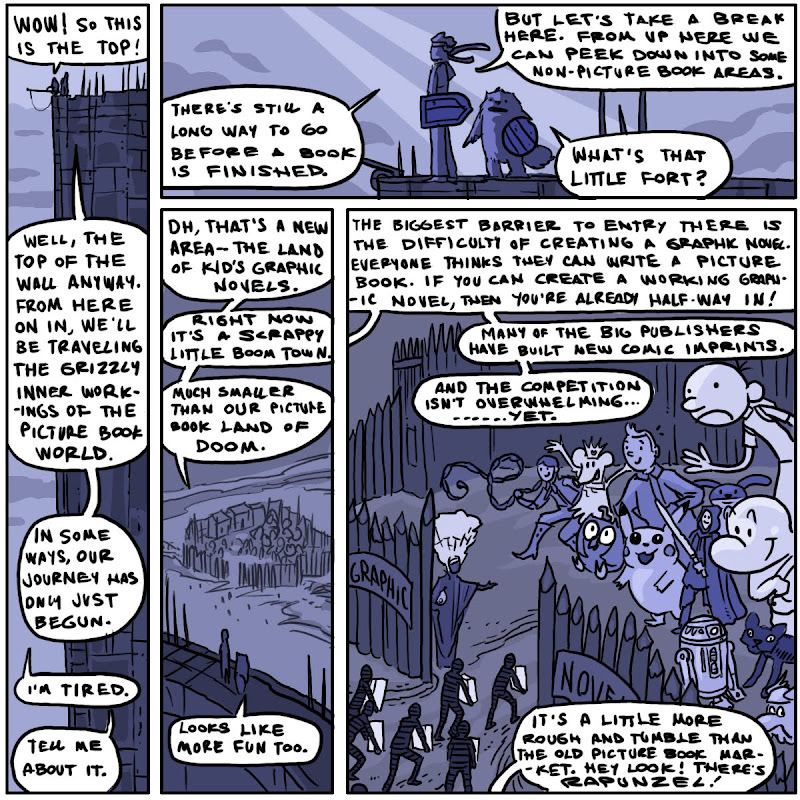 Synopsis: World War One with Bunnies. Let me tell you about one of my favorite scenes in all of children's media: it's Halloween, Charlie Brown is dressed as a ghost, Snoopy is dressed as the World War I Flying Ace, as Snoopy exits the door, ghost-Charlie Brown gives him a rigid salute, then Snoopy goes out and has a "Dogfight" with the Red Baron. He crashes, shakes his fist at the sky, then wanders the bombed-out French countryside to some cool clarinet music (or is it an oboe?) he sneaks past signs that say things like, "Pont-a-Mousson 3km." Then he goes into a house and marches to Schroeder playing, "It's a Long Way to Tipperary" then gets weepy during the sad part of the song, but shoulders through it bravely. Gosh, what a great scene. Nobody, nobody was as cool as Snoopy. This is at least six, seven minutes of "It's the Great Pumpkin, Charlie Brown" which is, what, 22 minutes long. What modern tv programmer would allow such a strange, slow scene? Anyway, I love it. I loved it as a kid and I had no idea what on earth it was. It was World War I--and it was soooooo cool. So that's a little of what I'm trying to capture here. 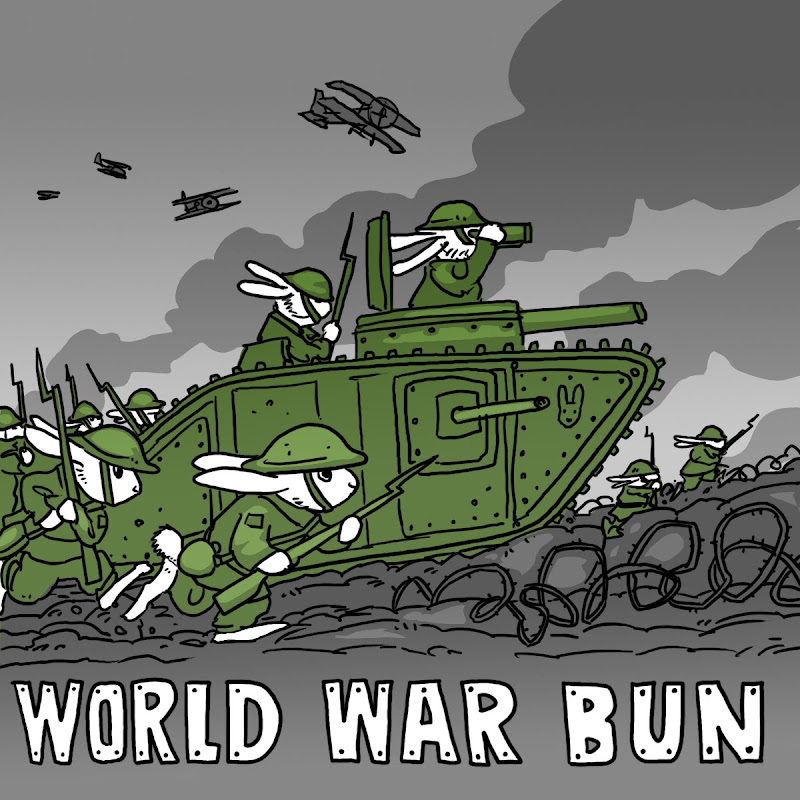 Plus, there aren't a lot of kid's books about WWI, let's explore it--with bunnies. Monday, mile 22--phew, these last miles are hitting hard. 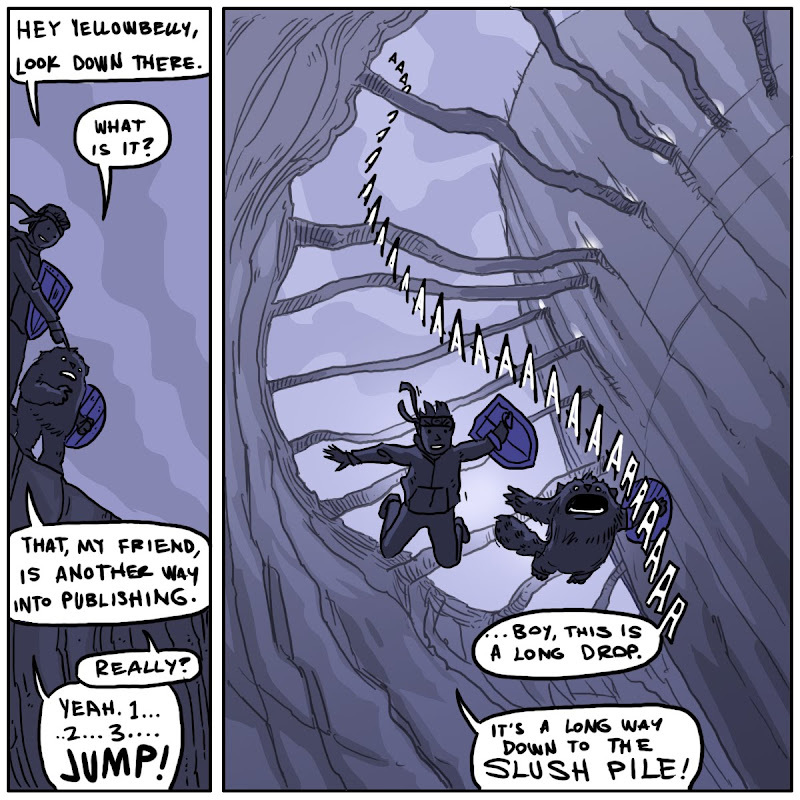 Once again, to stay on top of the marathon, I'm skipping today's LAND OF DOOM. 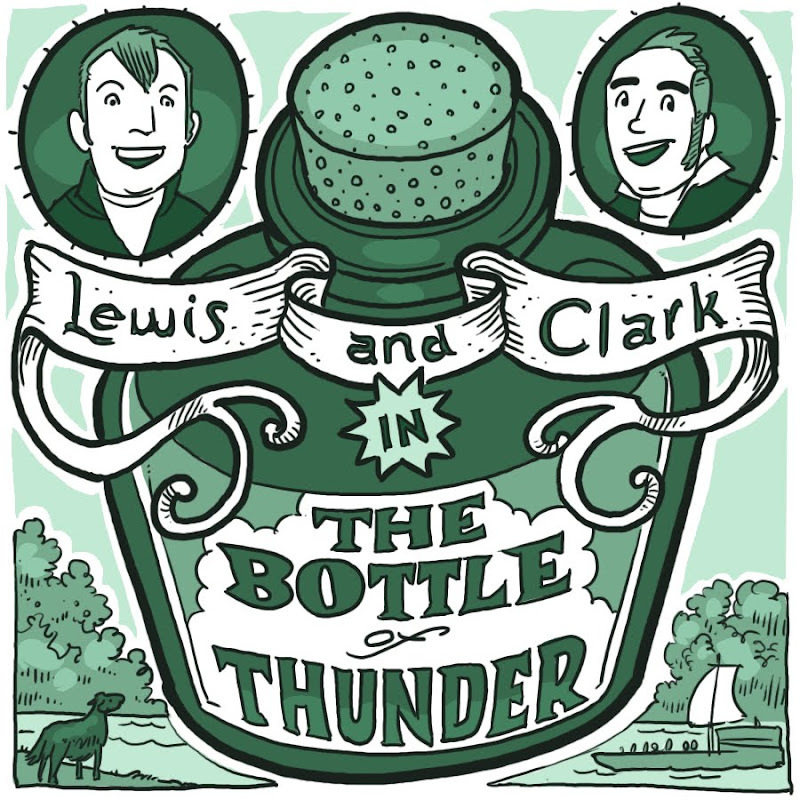 I've got one in sketch form, it'll be up tomorrow--the LAND OF DOOM may stretch out longer than the Picture Book Marathon--I've got a lot of material, and only a few more days. We'll see how it goes. Title: "No Touch the Ground"
Synopsis: The picture book version of one of my favorite games as a kid, "No Touch the Ground" a.k.a. 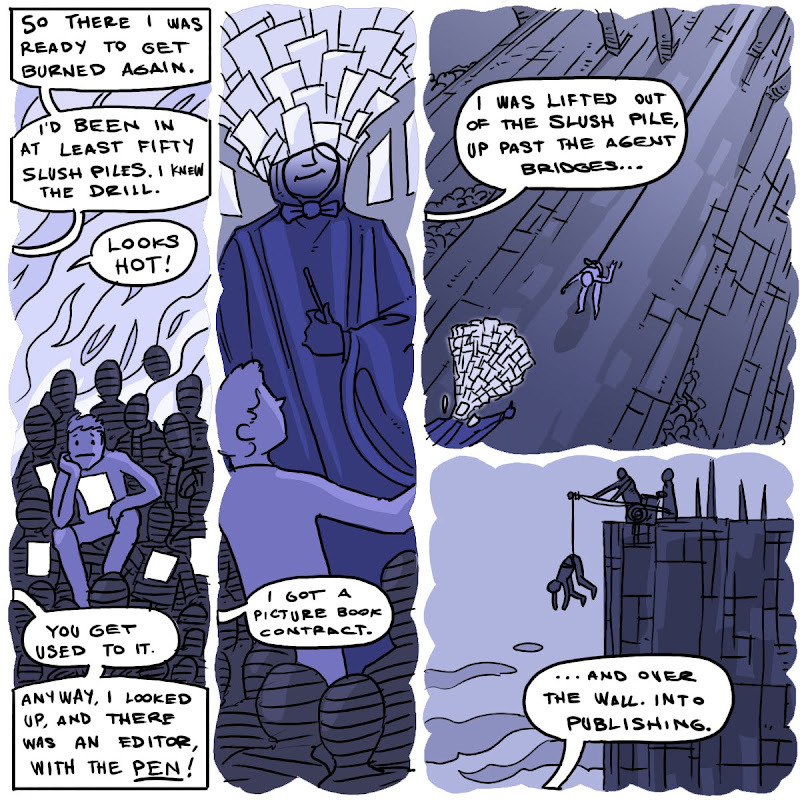 "Hot Lava" a.k.a. "Climbing on the Furniture." This one would be a wordless book. 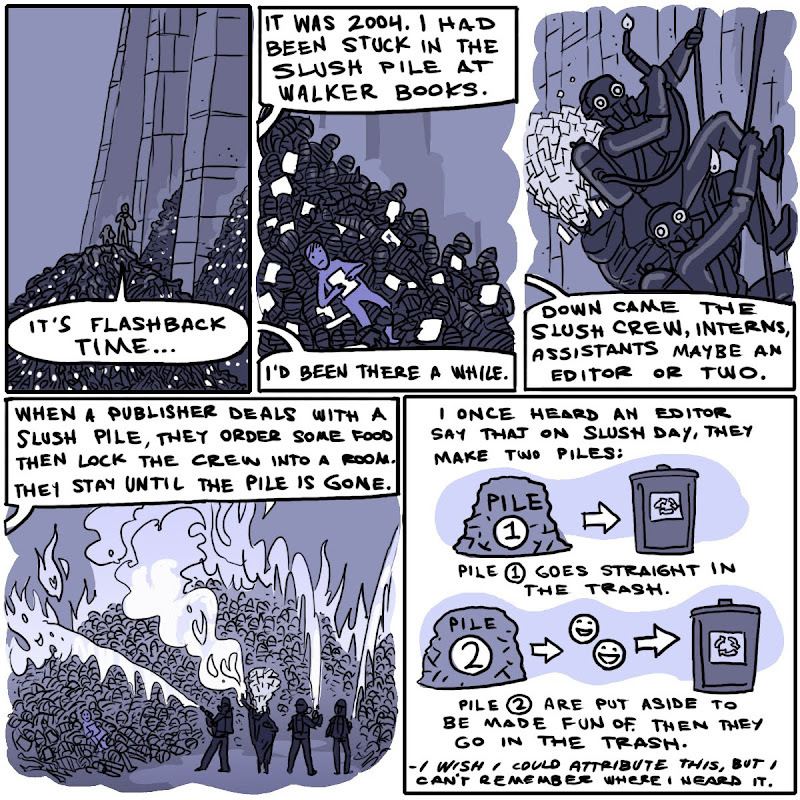 Each page featuring a room in a house, with a different reason why you can't touch the ground; 10,000 foot drop (seen here on the cover) pools of lava, snake pit, etc. What did you call this game? 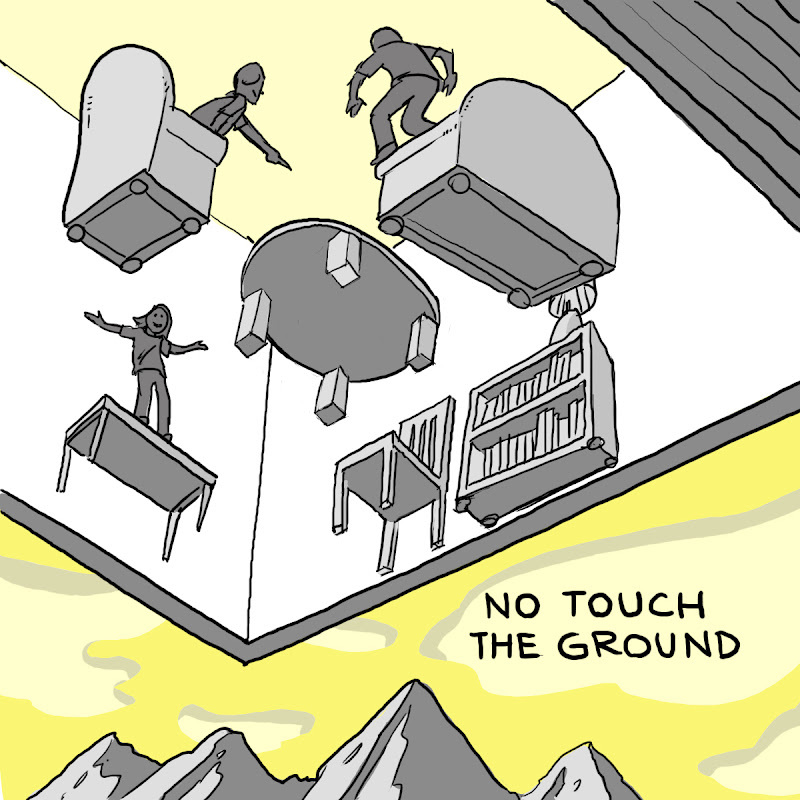 Anyone else call it "No Touch the Ground?" 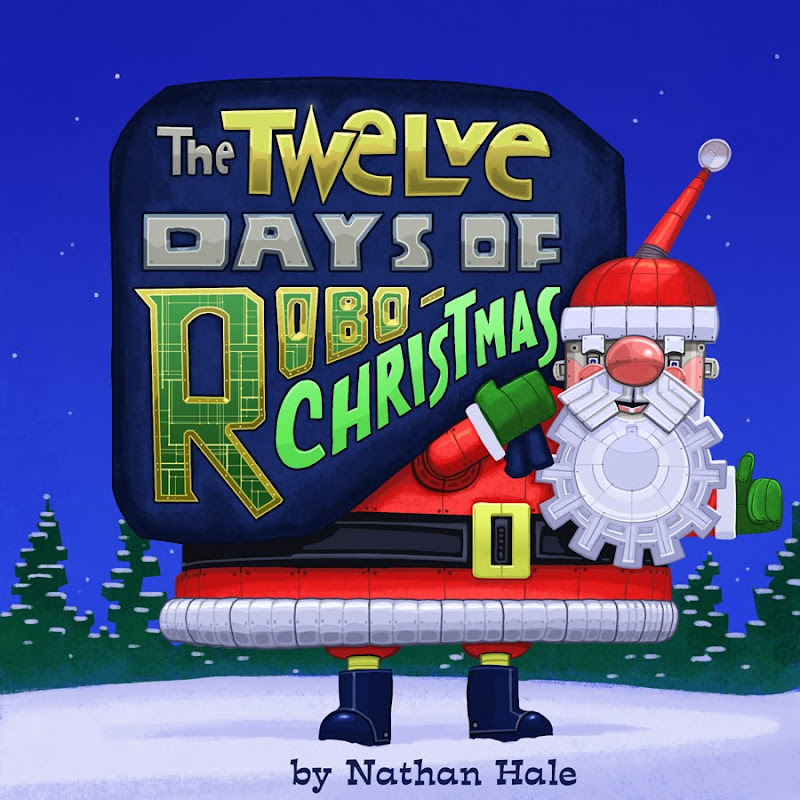 Title: "The Twelve Days of Robo-Christmas"
Synopsis: You know, wrench hens, turbo doves, it's the traditional song with a robot twist! 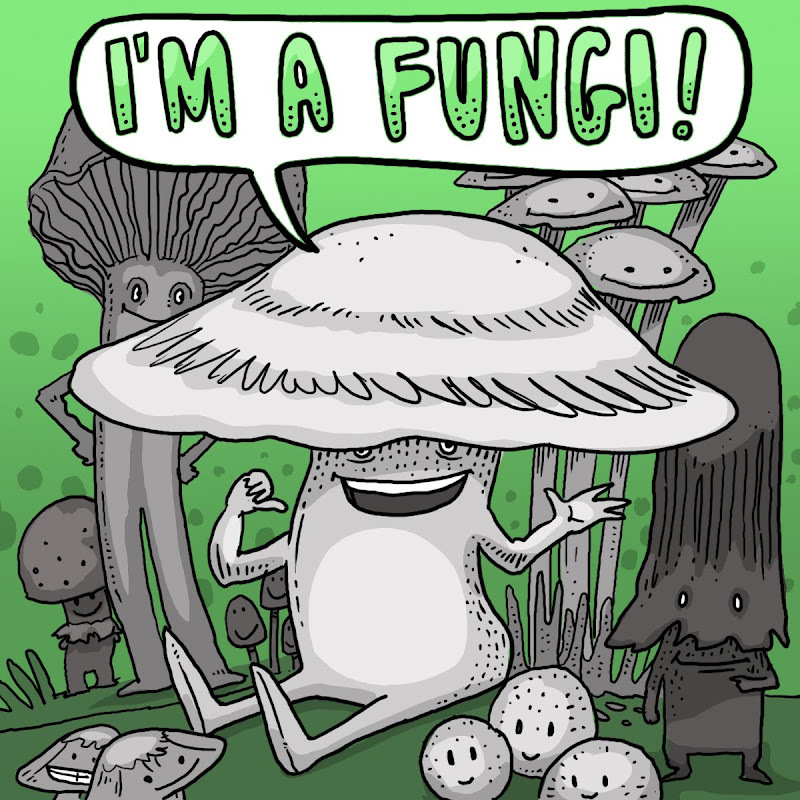 Announcement time everybody! Robo-Christmas is getting published by Walker Books for Young Readers (the same Walker mentioned above.) And here's the kicker, are you ready? It's coming out THIS YEAR! That's right, we're fast-tracking it for Christmas 2010! Pretty cool, huh? Technically, I didn't, um, write this during the Picture Book Marathon. 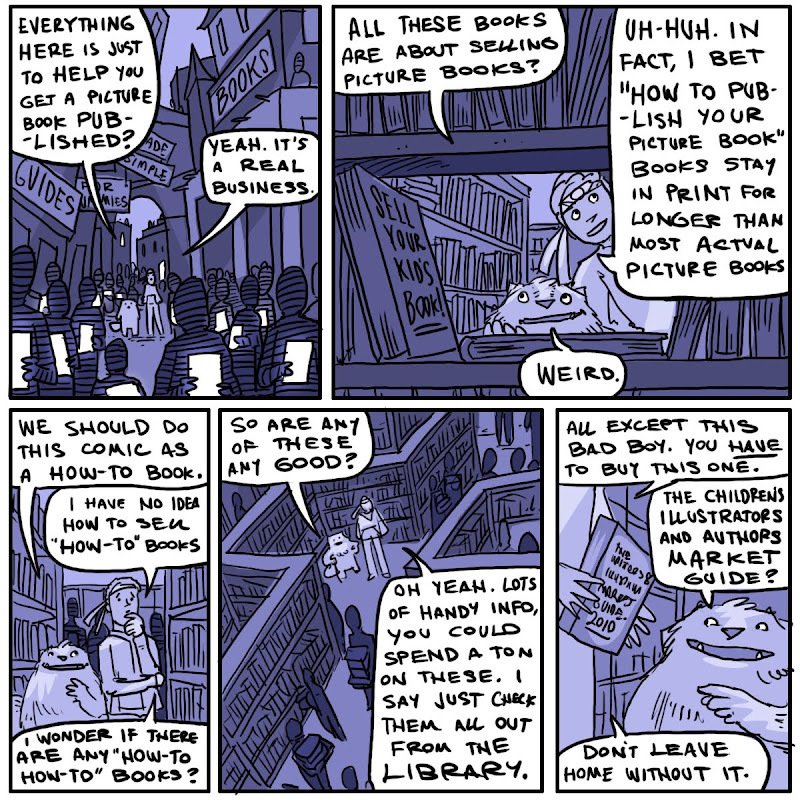 But you get a free day if you get a book picked up by a publisher. That's the rule, I just made it up. If you are new to the site, Robo-Christmas was my project over the holidays, I'd tell you to scroll back to December to check it out, but the original posts are no longer there. I can't be giving them away for free now can I? Title: "The Elephant of Surprise"
Synopsis: A naughty zoo elephant spends all day surprising people by playing pranks on them. 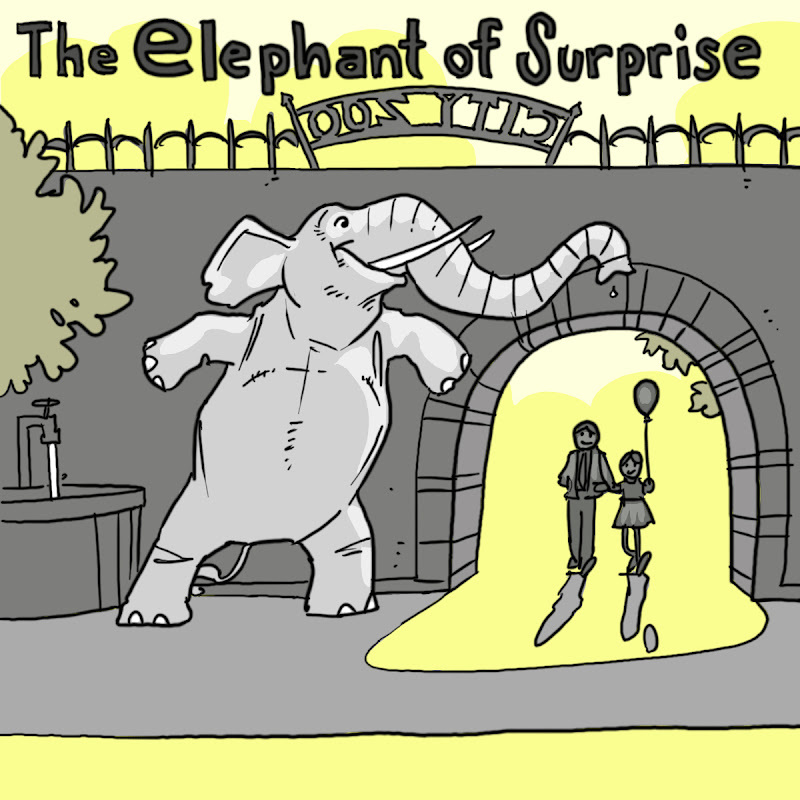 He is "The Elephant of Surprise!" Is there anyone at the zoo who can stop him? 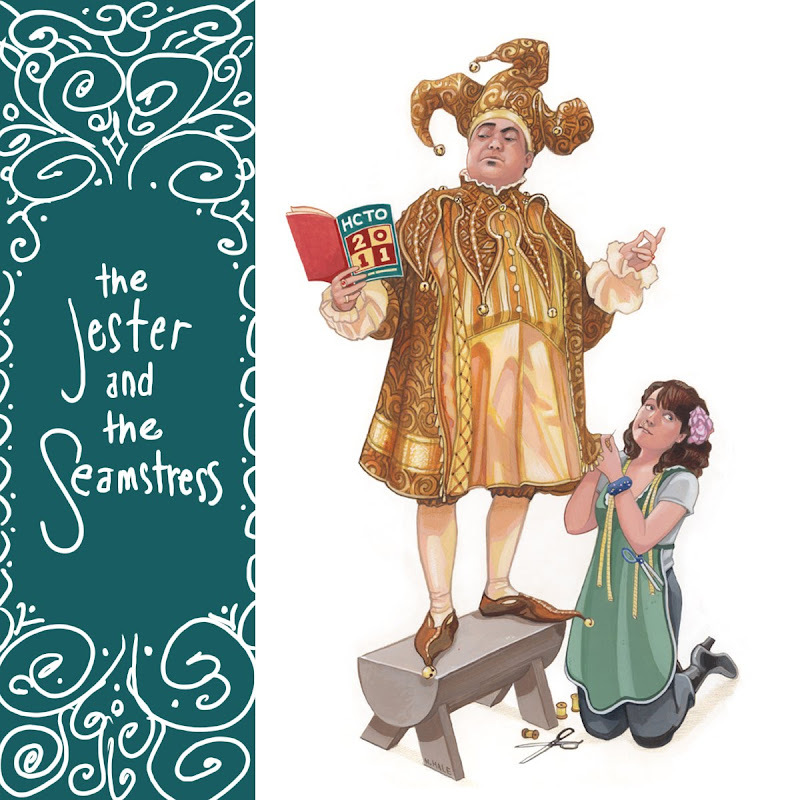 Yesterday's book, "The Jester and the Seamstress" had the most complex cover illustration of the whole run--it also only got two comments (one was my own.) Which leads me to believe that maybe for picture books, I should stick to the simplest style possible. The most simple cover so far was "The Line King" and it got 18 comments. This is all very interesting to me. What do you like more? 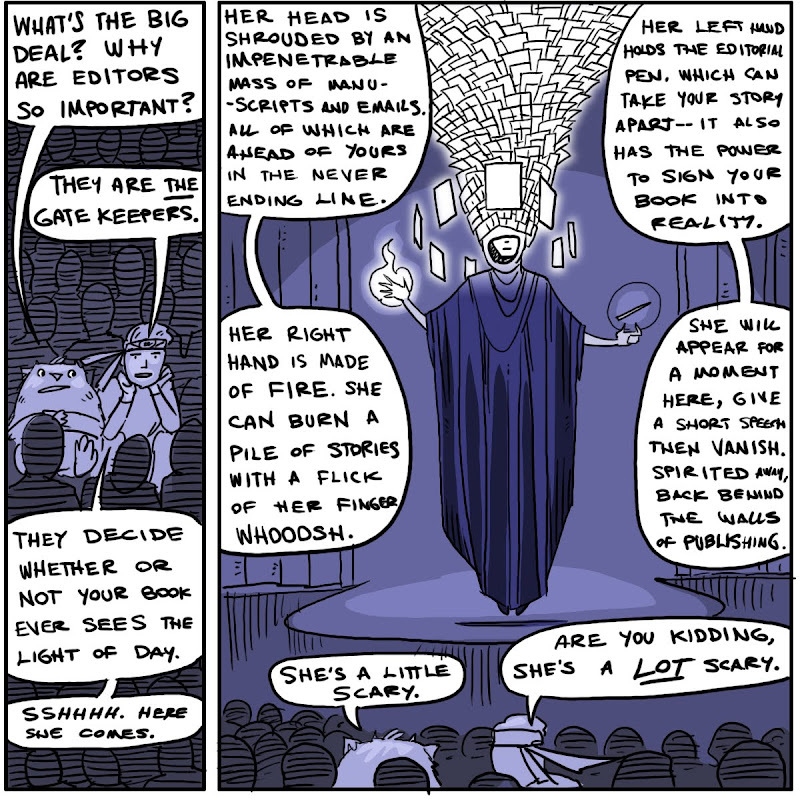 Cartoony, like today's book, or more elaborate work? 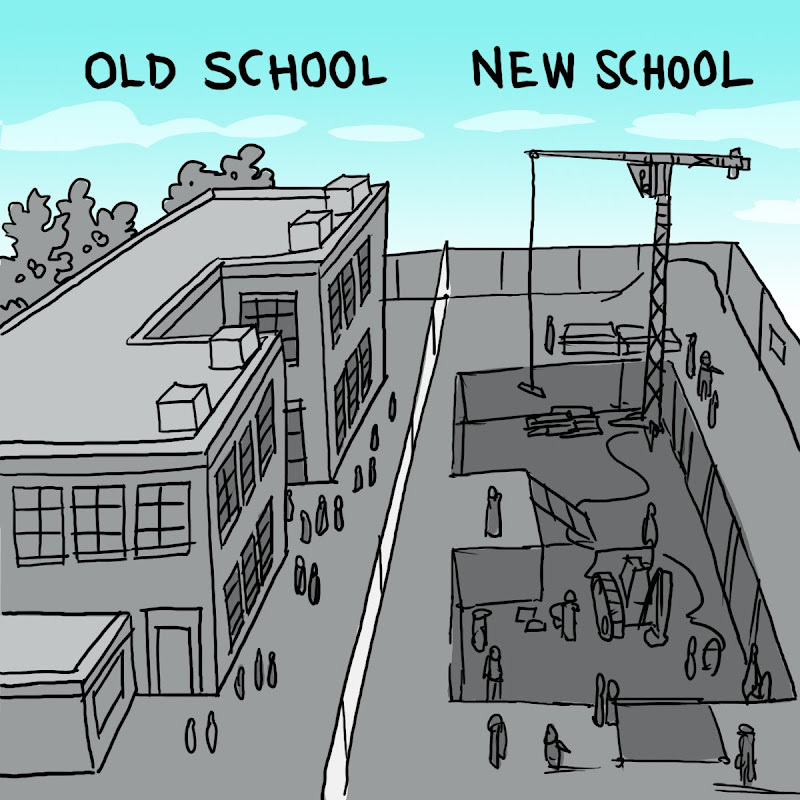 I'll tell you what--the cartoony stuff is so much faster...so, SO much faster. Also, the Station got a whole bunch of new followers yesterday, ten or so. Did somebody post a nice link to me? Speak up, new folks, how did you find us? And welcome to the Station. Hey southern California readers, Shannon and Dean Hale are coming your way! Here's a chance to get your CALAMITIES JACK and RAPUNZEL'S REVENGES signed by the authors! Here is a list of where and when. If you tell them Space Station Nathan sent you, they will perform an interpretive dance just for you! Title: "The Jester and the Seamstress"
Synopsis: A jester is so funny that he becomes rich. He begins spending money on more and more elaborate costumes. Each costume makes him look fancier, but makes him less funny. The seamstress gets funnier, though, because she is paid for each costume. As you can probably guess, I didn't create this artwork for the Picture Book Marathon. This is a painting I just finished for the HCTO (Hale Center Theater Orem) if you've been following the blog long enough, you've seen the yearly jester artwork (scroll down past Chuck for the jesters.) 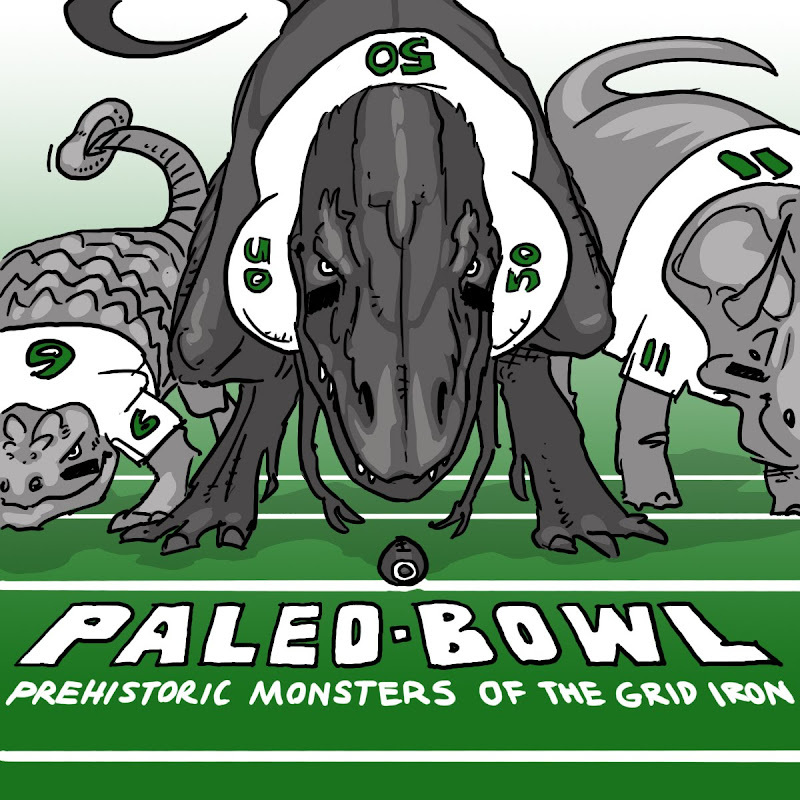 Anyway, while painting this year's program cover, I made up a little story about the characters. Two birds with one stone, eh? Seriously, why didn't somebody stop me? I could have spread this material out over two and a half months. Anyway, we're in it now, and there's no going back. Synopsis: It's the Ugly Duckling story with flying reptiles. 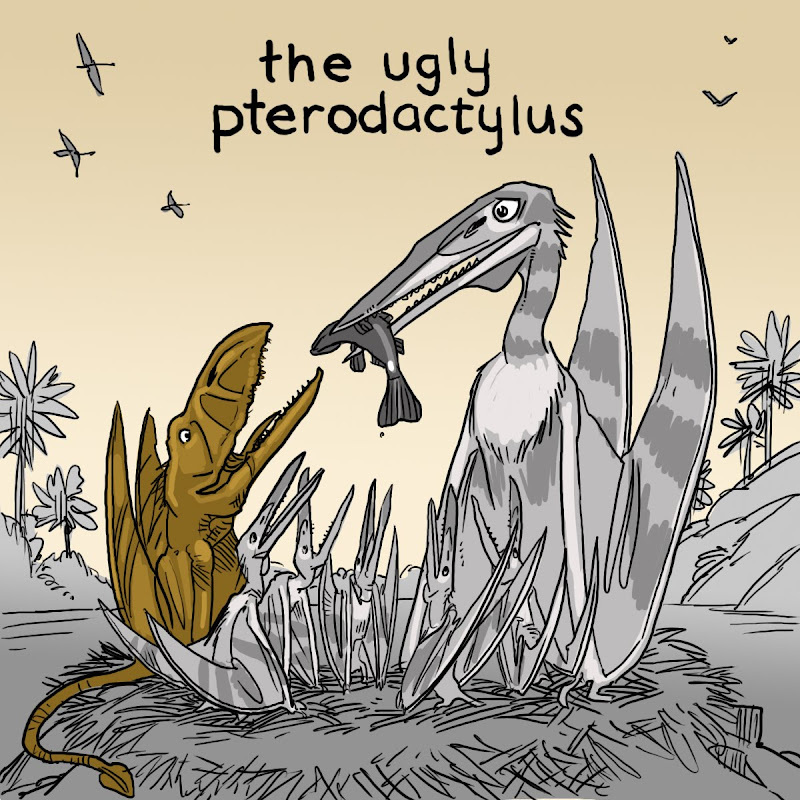 The ugly one turns out to be, not a beautiful swan, but a giant-headed Dimorphodon--who ends the story by eating his adopted family. I was pretty happy with this idea. Flying reptiles don't get the attention their dinosaur counterparts usually get. 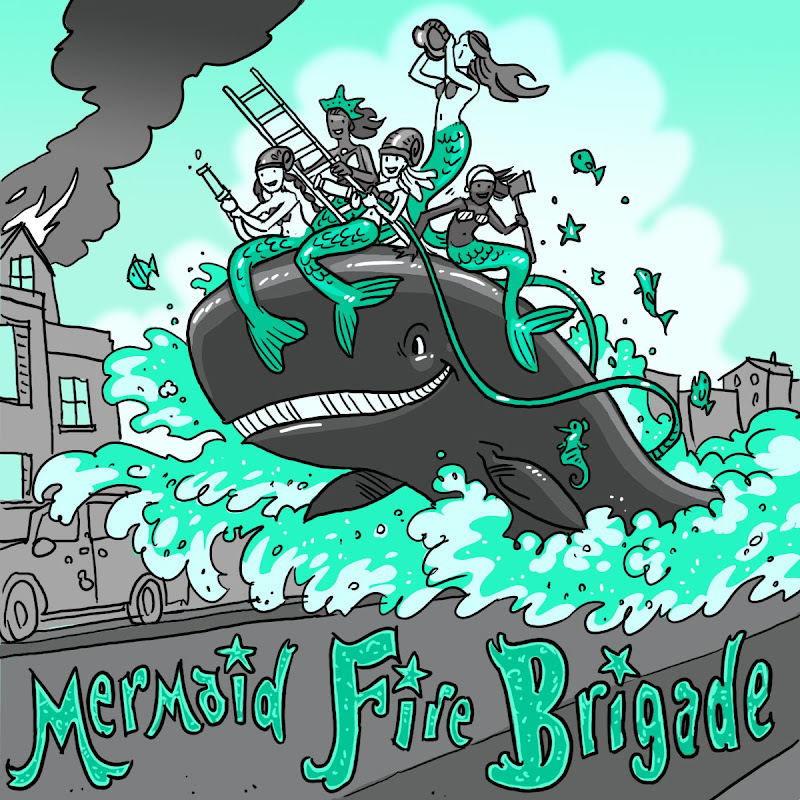 My wife walked by and saw me working on it, and mentioned this song from the PBS show "Dinosaur Train." Bam! It's like Hibernation Station all over again! Although this time, I was too far along to stop. Stupid Dinosaur Train. 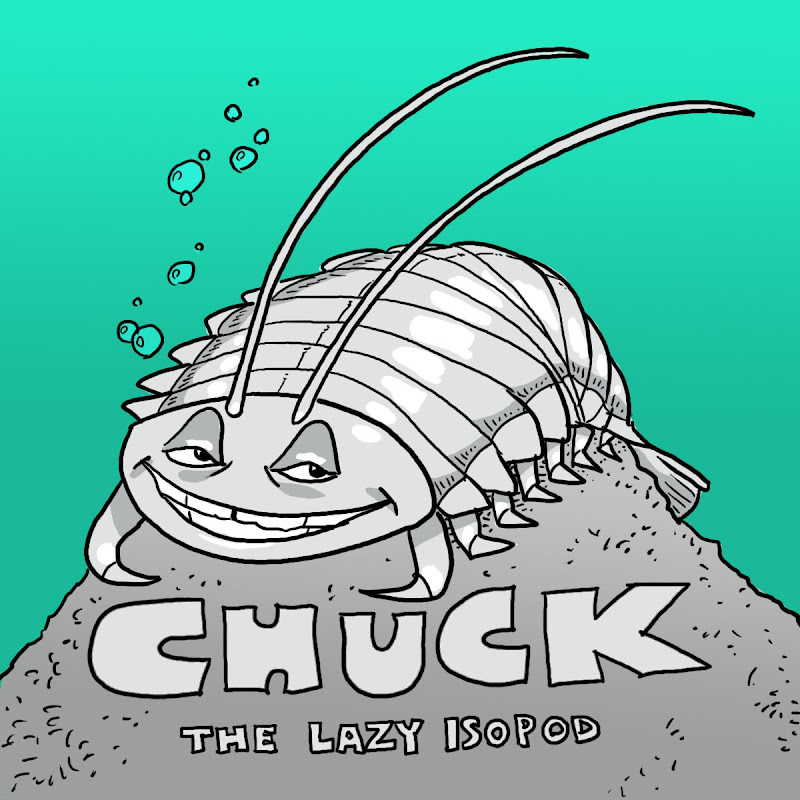 Title: "Chuck: The Lazy Isopod"
Synopsis: Chuck is an isopod who lives at the bottom of the ocean. Every day he has to search for food and he is tired of it. He wants the food to come to him for a change. 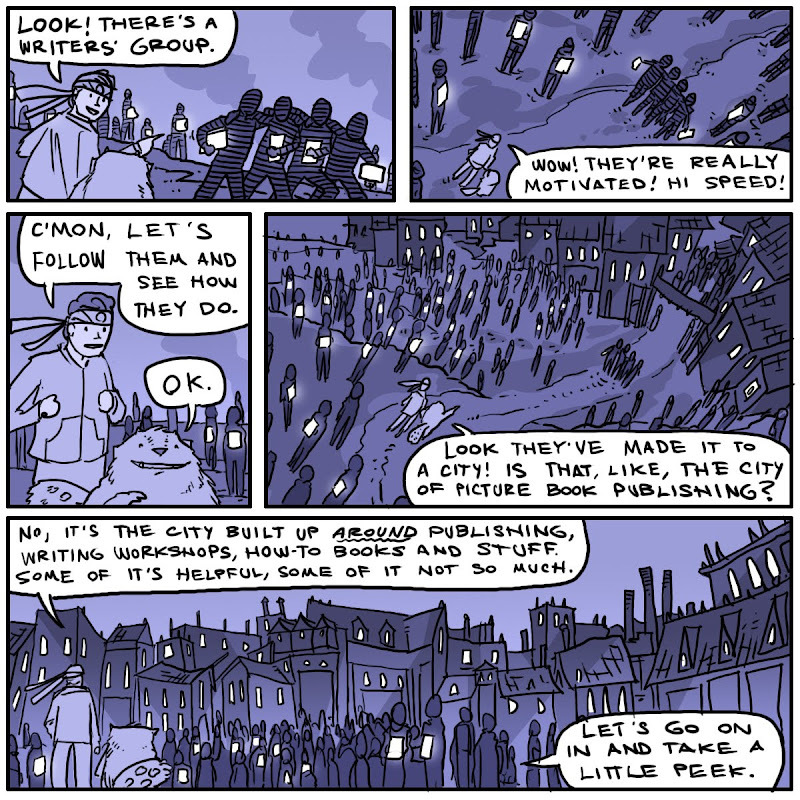 He sets out to find the perfect, lazy job. 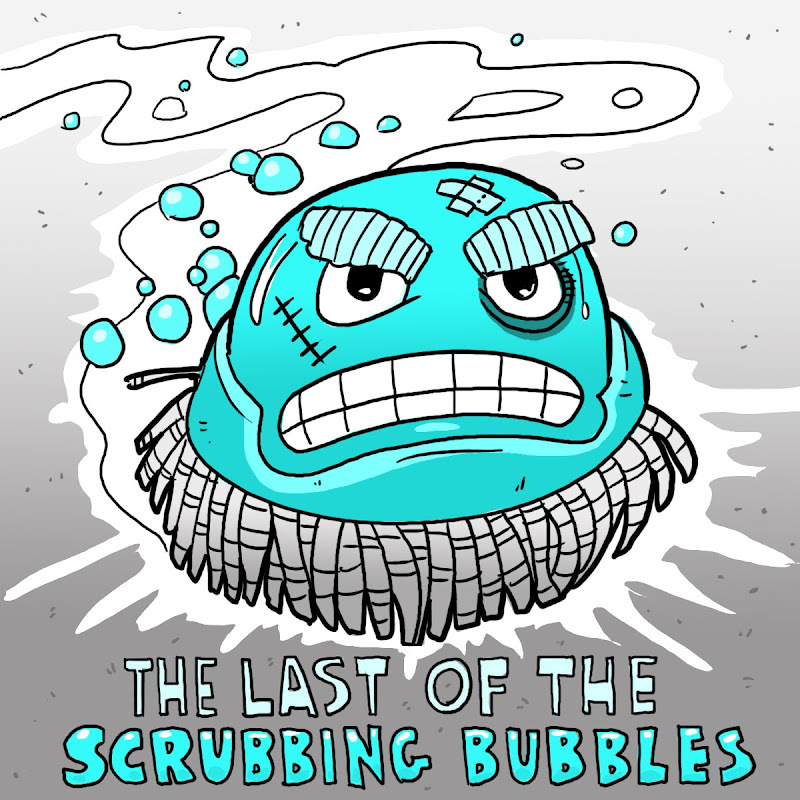 The ending features a disgusting (but science-based) twist. Chuck's another visiter from an earlier blog comic story--my first blog comic story, really. 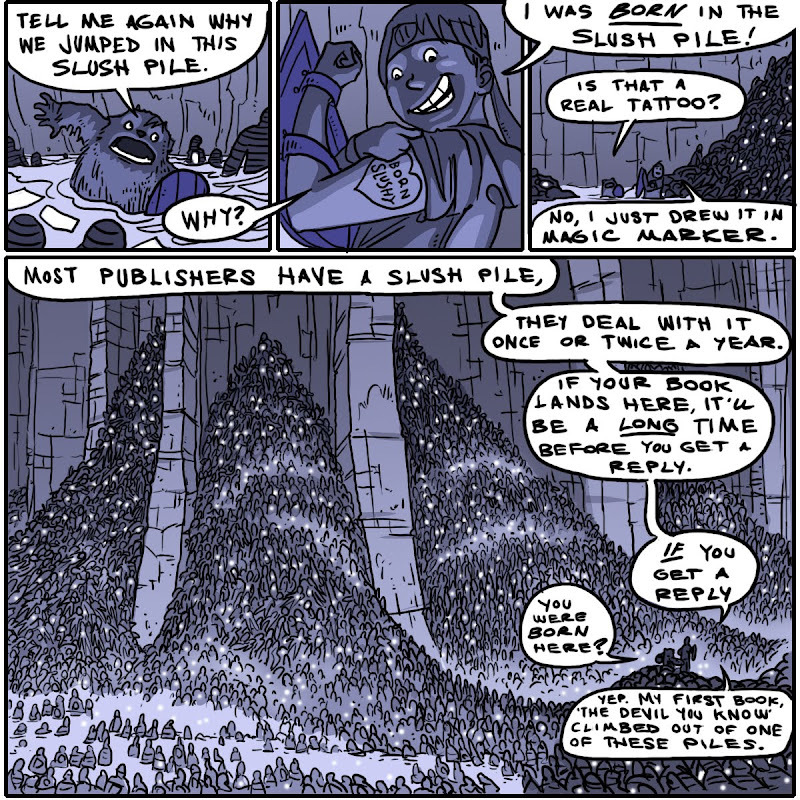 Most of the books in the marathon so far have been made up/written the day they were posted. But this one, and Alpha Centaur both have roots in past stories. 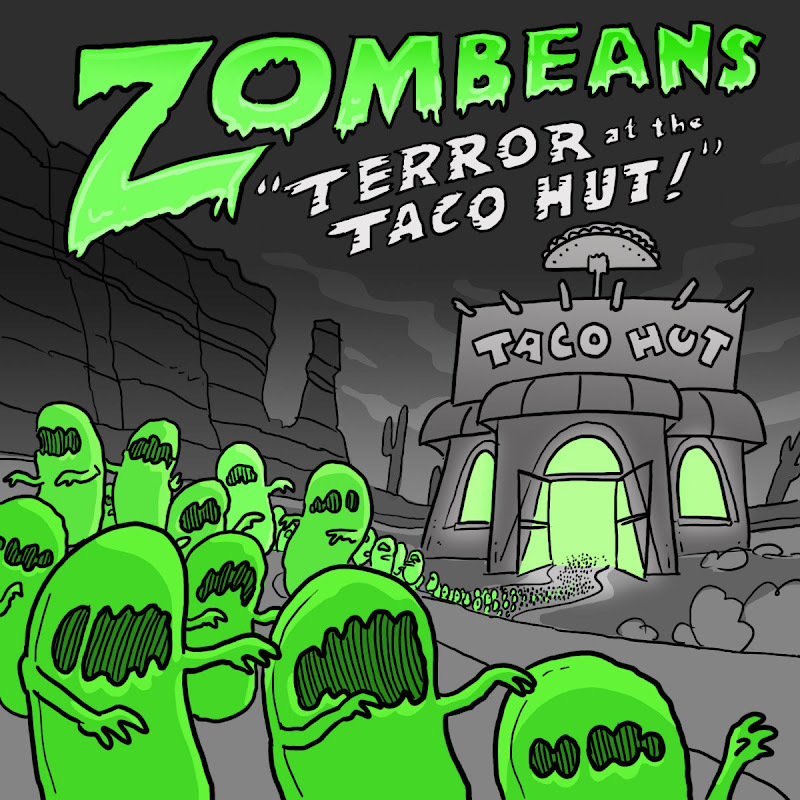 Title: "ZOMBEANS: Terror at the Taco Hut!" Synopsis: Fried beans are good, refried beans are delicious, but re-refried beans are deadly. When the lone cook at the Taco Hut accidentally re-refries the beans, Zombeans are born. And they unleash terror on the small desert town. Can anything stop them? 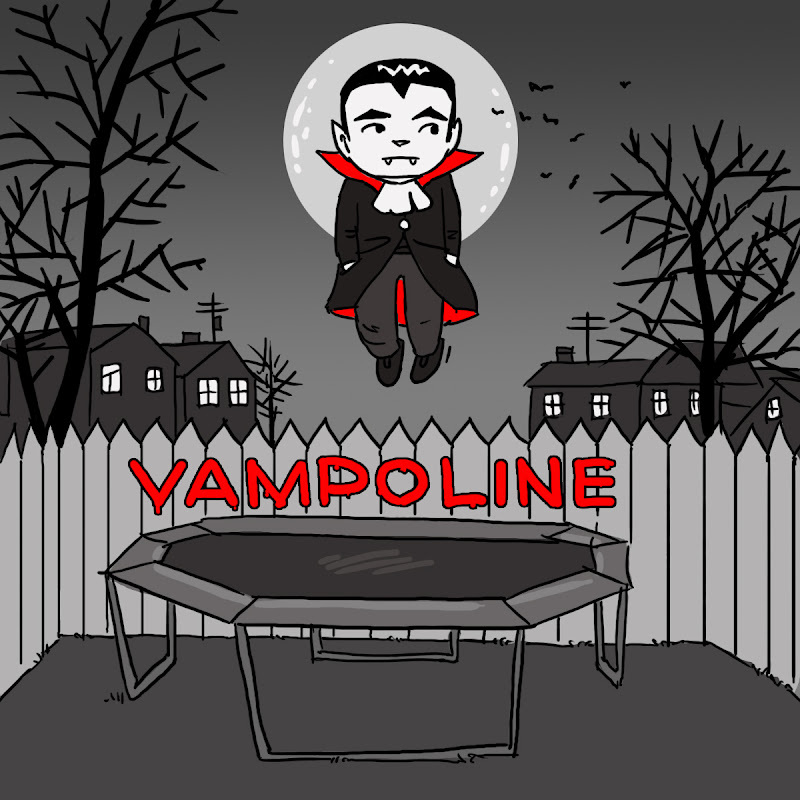 After yesterday's vampire post, I figured I might as well stick to the horror trend. Vote Now on the Rapunzel's Revenge Trailer Contest! 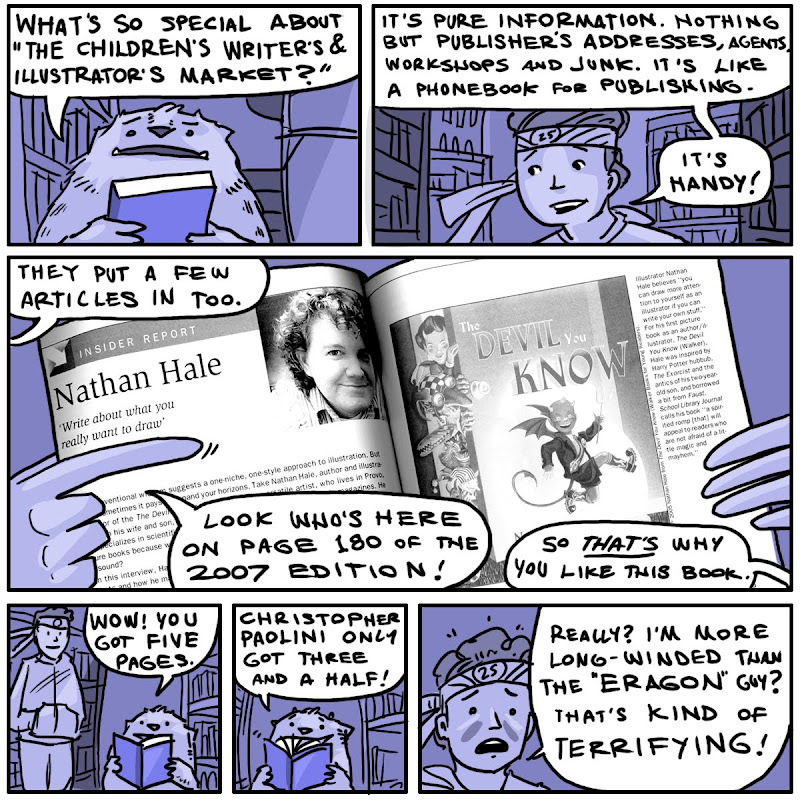 As I'm sure you know, our good friend Shannon Hale has been running a Rapunzel's Revenge trailer contest. Well the entries are in, and it is now voting time. Jump over to her site to see the amazing entries and vote on your favorite! I was just sitting down to write my story for the day; "Next Stop, Hibernation Station!" It was going to be a bedtime story about a cute little train full of animals on their way to hibernate--what can I say, I still had bears on the brain. I had pulled up a few lists of which animals hibernate. And then checked Amazon, just to see what children's books were out on the topic. Now, it's not unusual to find a book that parallels your idea. You get a cool idea, then find out that someone did a similar book in 1974. 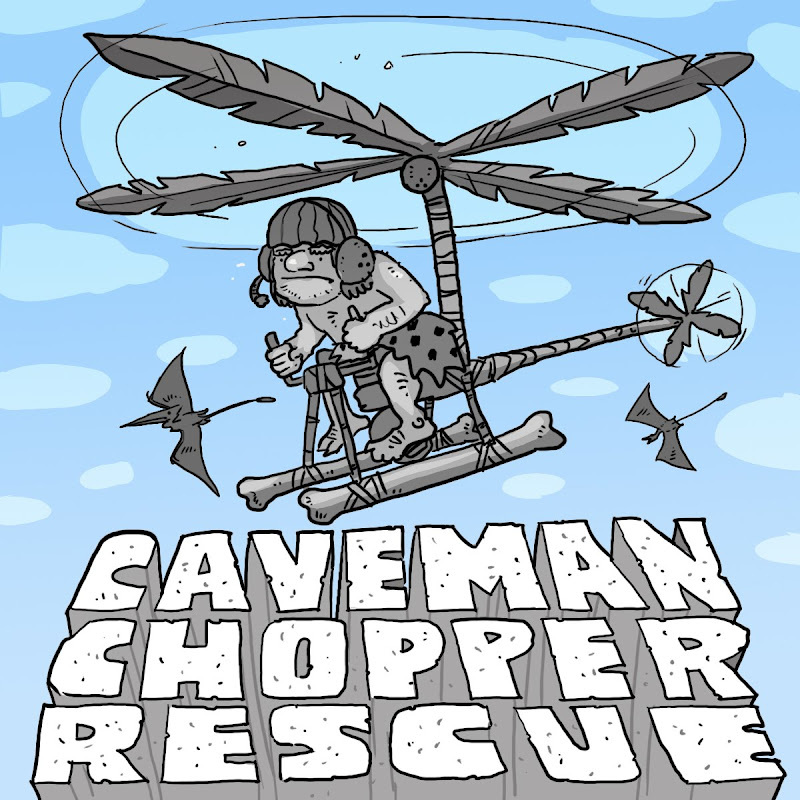 This one is crazy, it comes out summer 2010! Yeah, brand new book--almost the exact title--and with a train on the front! 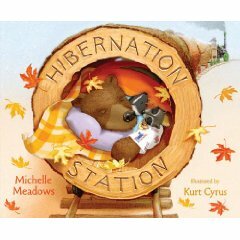 What are the odds, I've never seen this book before, was just playing with the word "hibernation" this afternoon, feeling pretty clever. 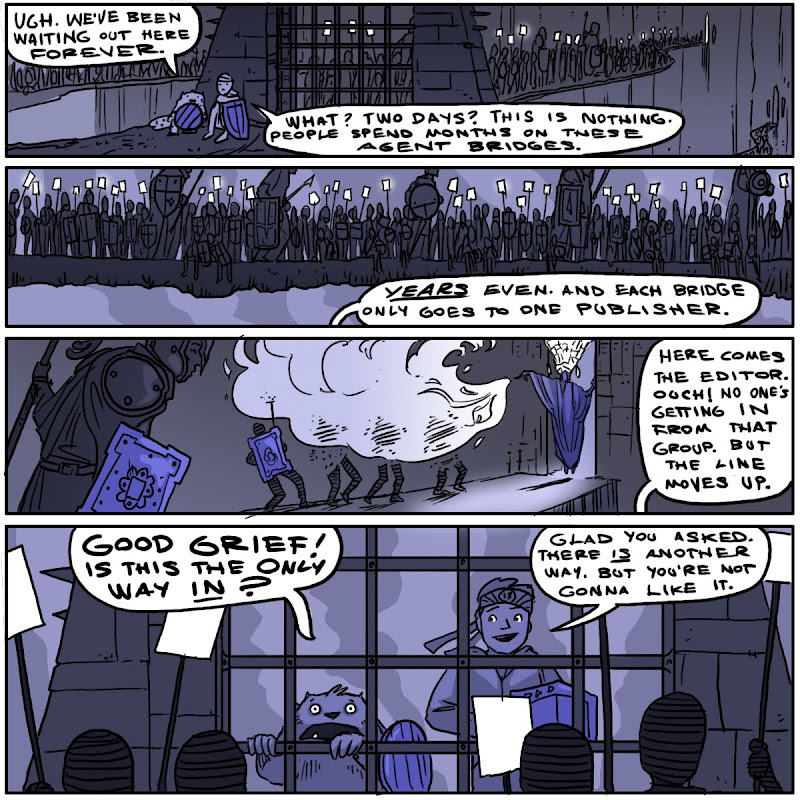 Wow, just goes to show you, there are no new ideas under the sun. Anyway, best of luck to Michelle and Kurt, this looks like an adorable book. Now I need to think up a fresh idea. Quick. 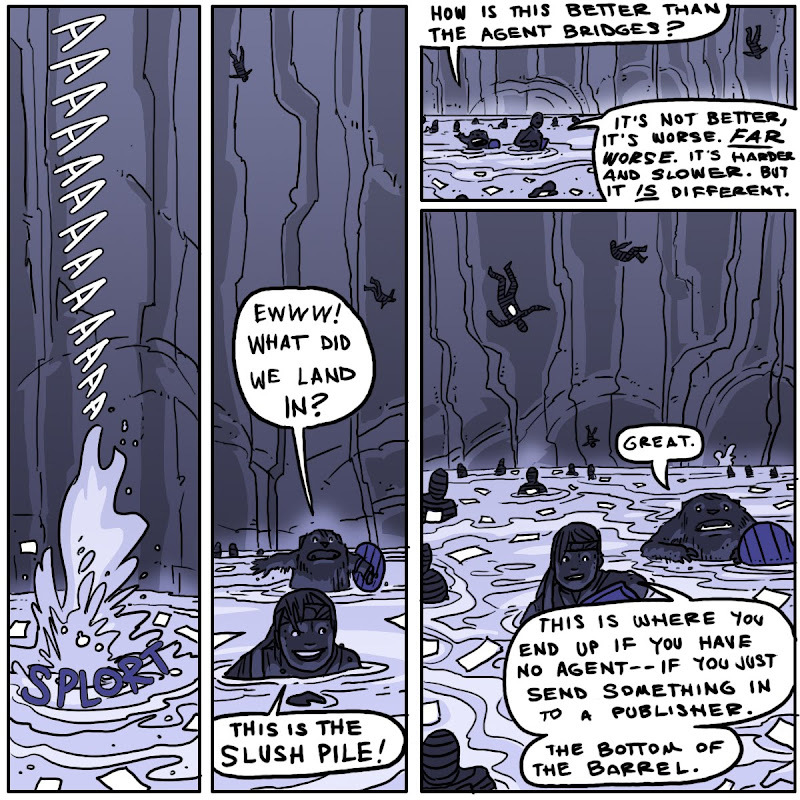 No LAND OF DOOM comic today--there are two good ones you may have missed over the weekend. Scroll on down for those. Title-less covers are so hot right now. 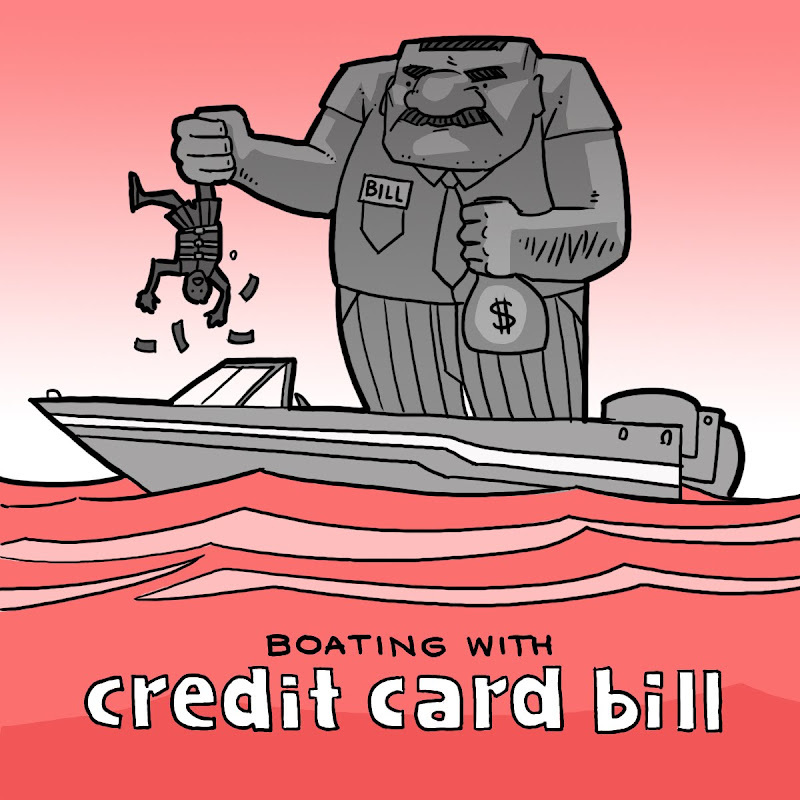 Can you guess this story by the cover? 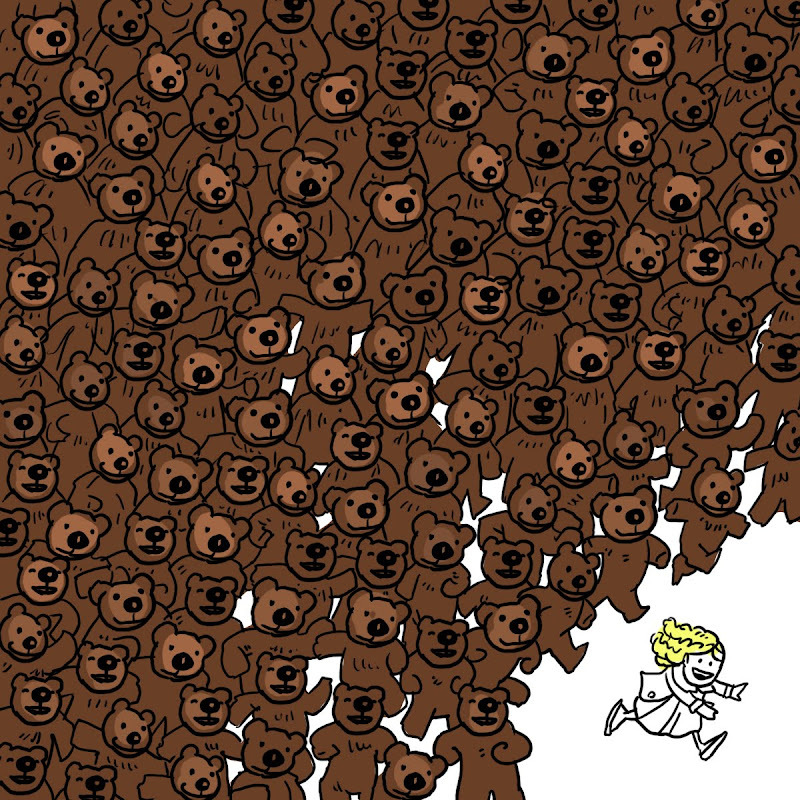 "Goldilocks and the 300 Bears"
This is a wordless story, with a wordless cover. Woops, I should have announced this earlier. I'll be one of thirty authors at the South Towne Marketplace Barnes and Noble in Sandy, UT today, from 1-3 this afternoon. Yowza! 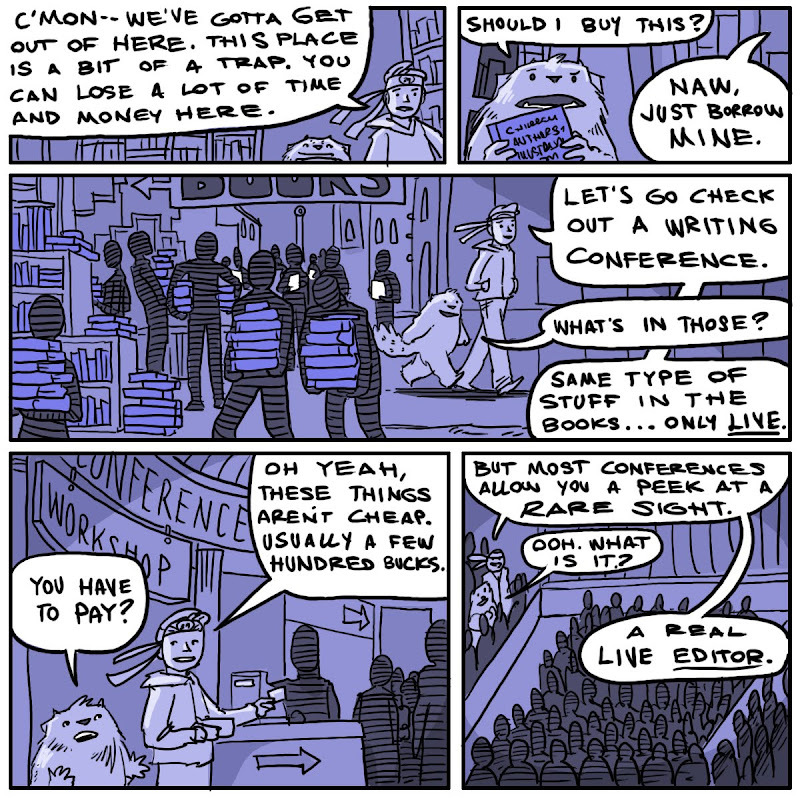 I bet there will be more authors than customers. Prove me wrong. This is the companion book to "Alpha Centaur." 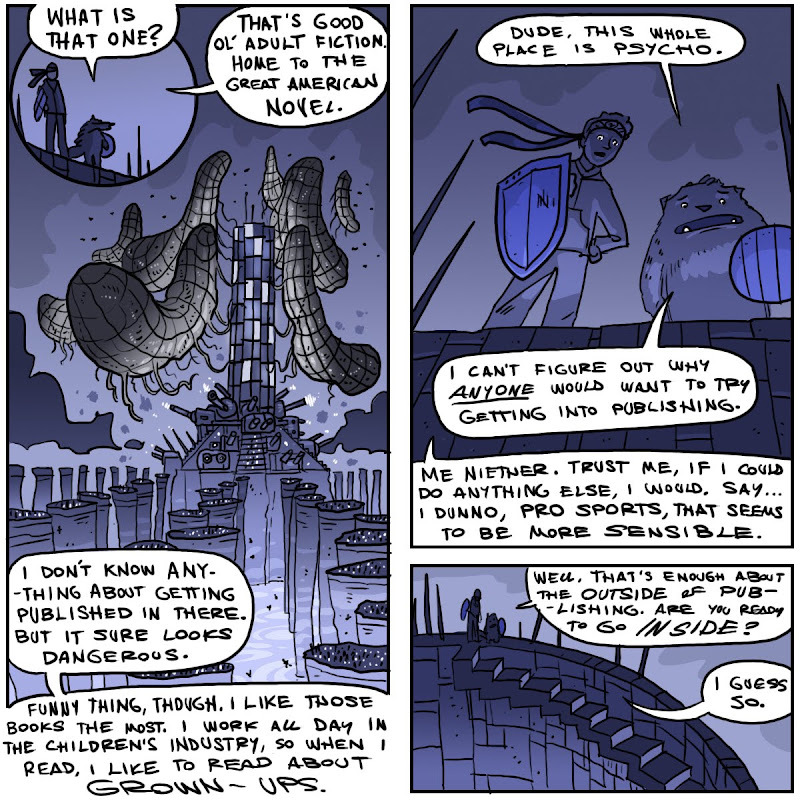 See, the inter-dimensional exchange that brought Chester into the land of Science Fiction, also put a giant space construction robot into a Fantasy world. Chester and WEX-5 are essentially exchange students, swapping cultures and locations. 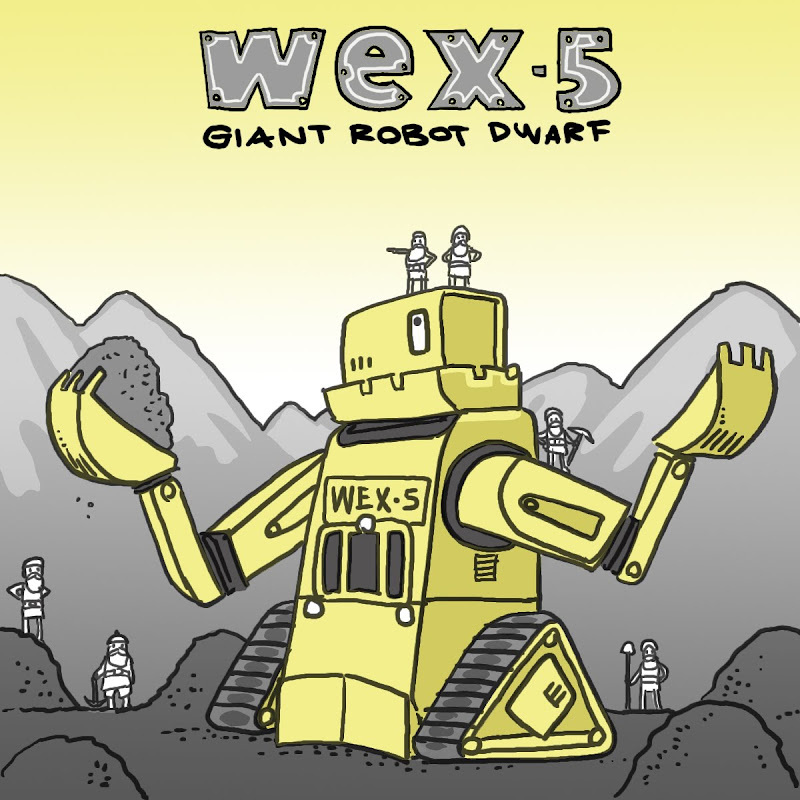 Since WEX-5 is a digging robot, he is co-opted by some dwarves, and spends all his time digging holes for them. His story is substantially less interesting than Chester's. 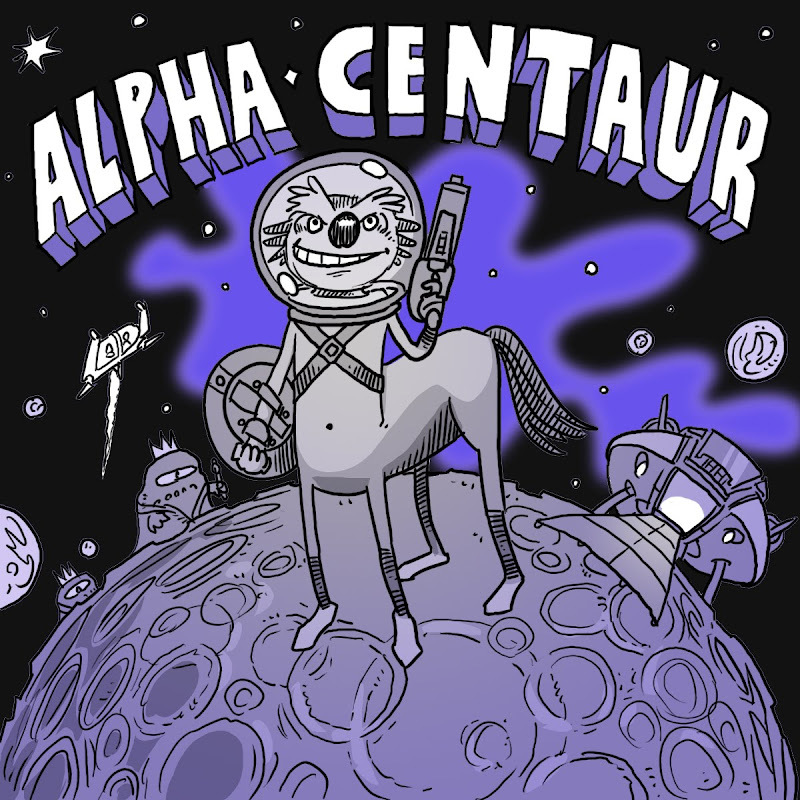 Still, there are 38 sequels, to match the "Alpha Centaur" series. Phew, this is my first post in the marathon where I'm posting on a day I usually don't. Friday night is weekend territory. I'm starting to feel the burn. Today's LAND OF DOOM episode is a little on the weak side--but hey, with 28 of these in a row, there's bound to be some filler. We'll get on to some more exciting stuff soon. Trust me, there are monsters ahead! 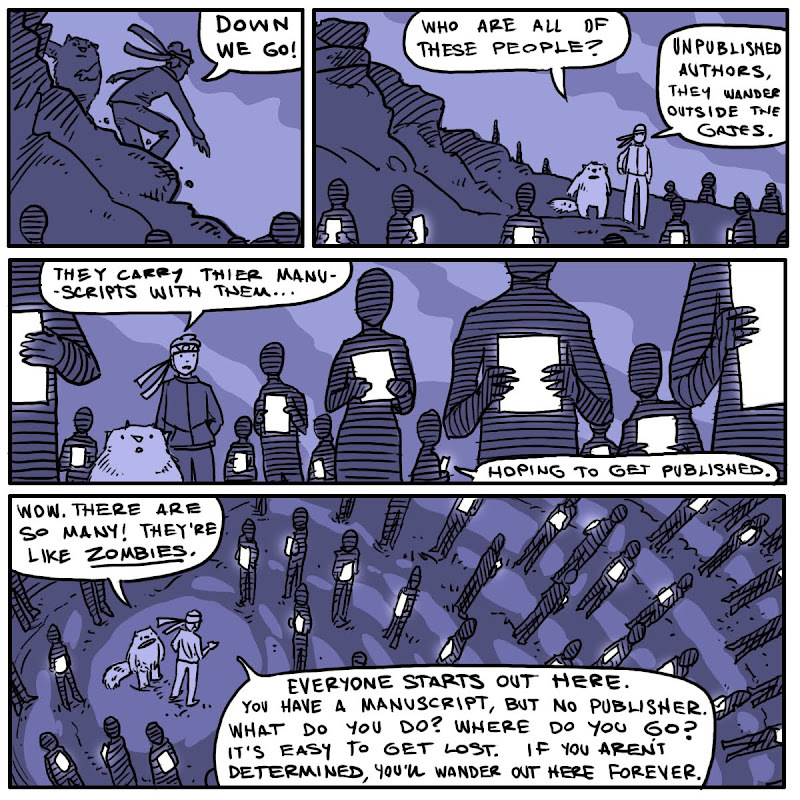 Why, look who it is--it's Chester the NaNoWriMo substitute monster! I knew he'd be back! 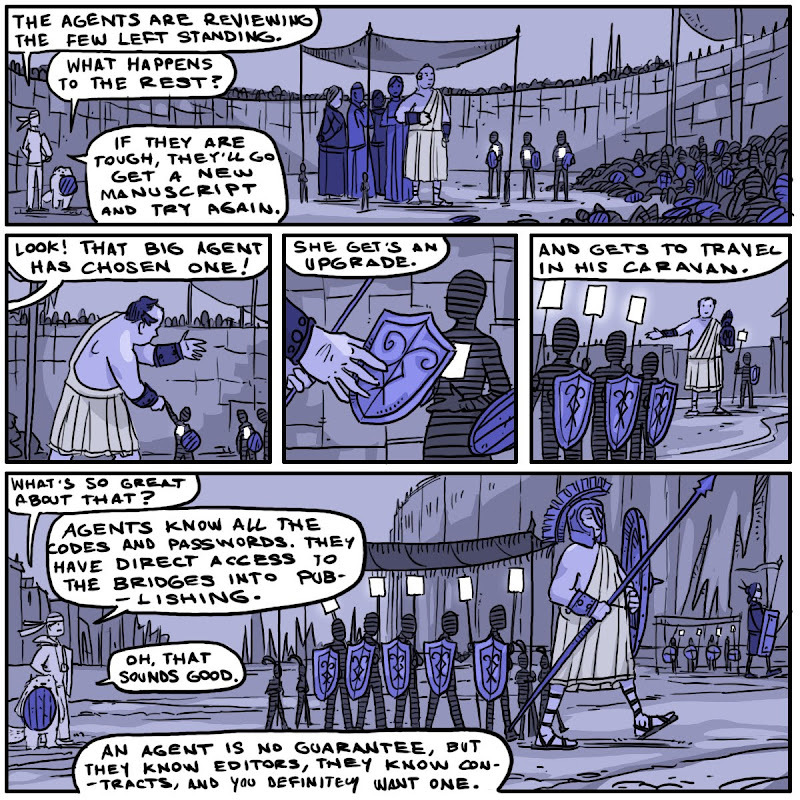 Now he's in his own story. It's inter-dimensional exchange time! 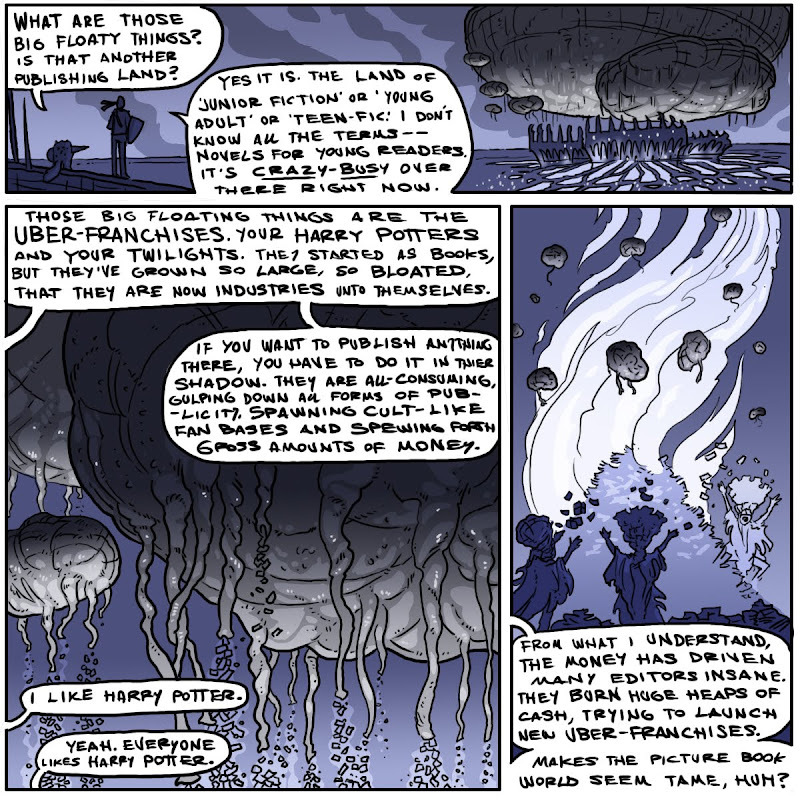 Chester's been pulled from his land of dwarves and wizards and dropped into a space opera. 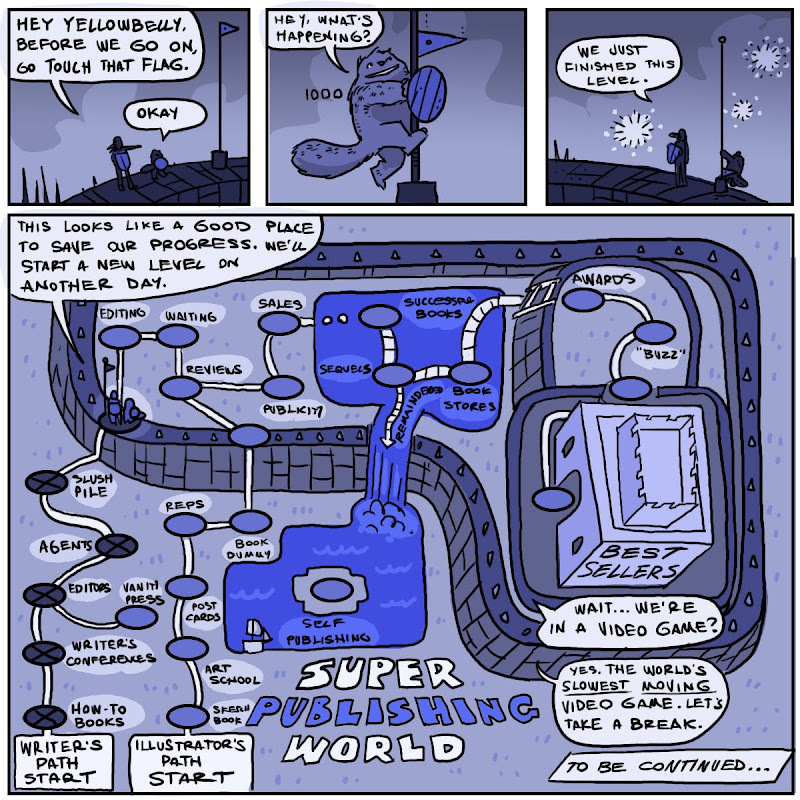 This one's less a picture book, and more of an early reader comic book...with potential for a 38 book series. Wow! The record's been broken again! Even more followers joined yesterday than the day before--thanks for clicking! Welcome to the station! 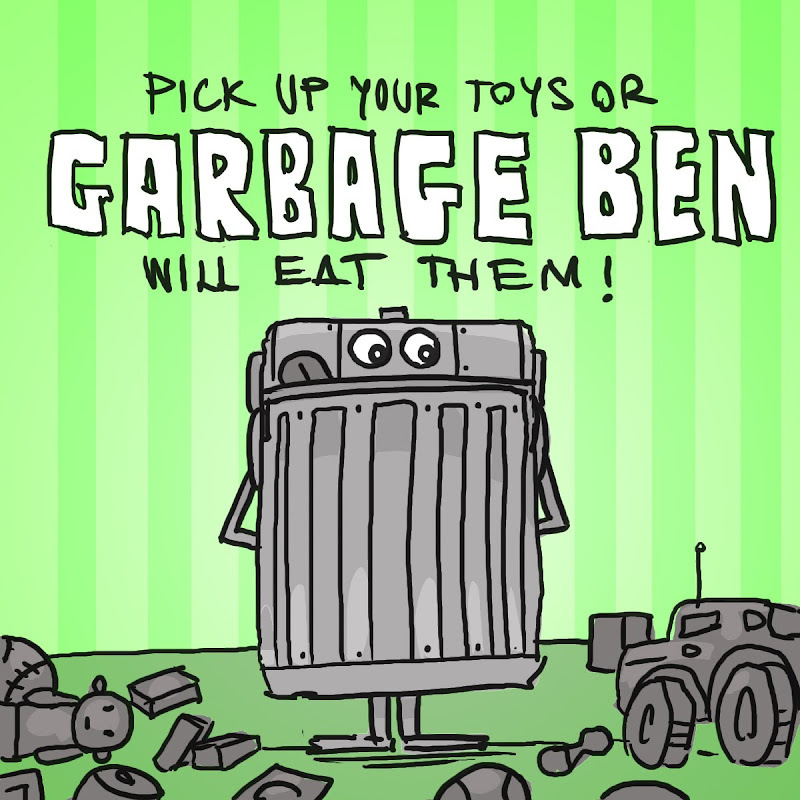 Title: "Pick Up Your Toys or Garbage Ben Will Eat Them"
Synopsis: Pick up your toys or Garbage Ben will eat them. Thanks for clicking on that "Follow" button everyone--yesterday was the single biggest follower leap I've had in one day! Keep 'em coming! 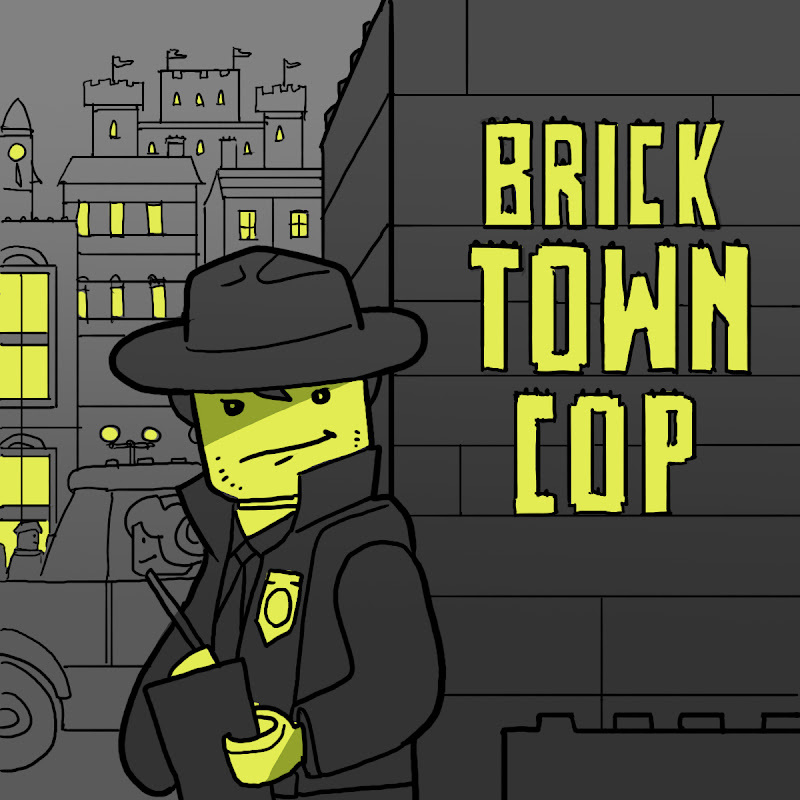 A crime story set in a (not-quite-LEGO-wink-wink) brick built town. A Class 3 "Brickocide" has been committed, and the Brick Town Cop is on the trail. 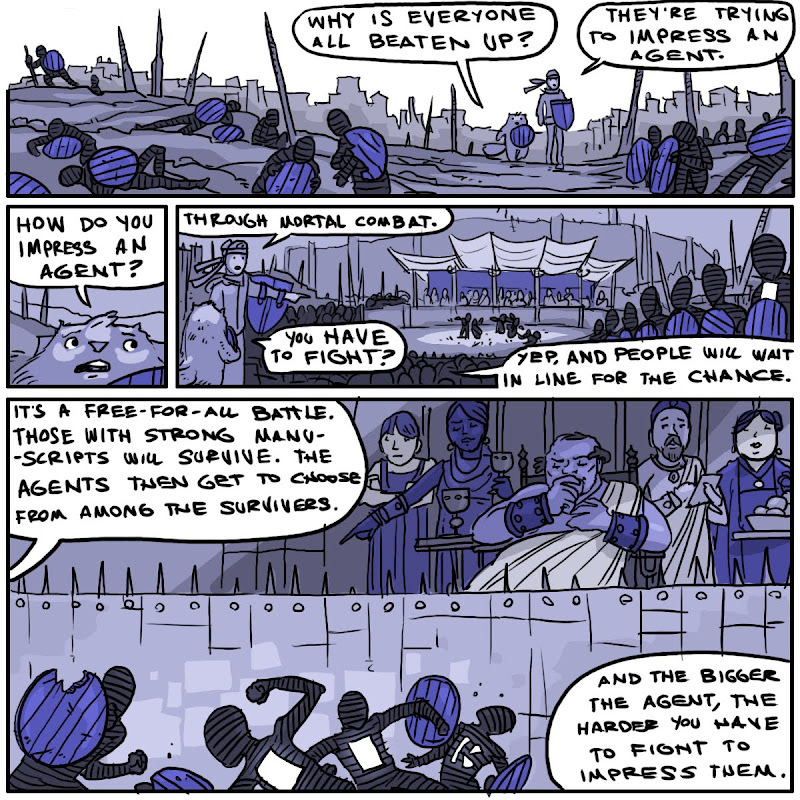 He has to deal with many of the unsavory citizens of Brick Town, Pirates, Ninjas, Aliens, etc. in search of the perpetrator. Yes, this story is entirely fueled by my desire to purchase LEGO for work purposes. I don't know what would be more difficult; building the entire book out of bricks and photographing it (ala JACK vs. the Vikings) or illustrating the book and PAINTING all those brick scenes. Phew, I get tired thinking about either option.